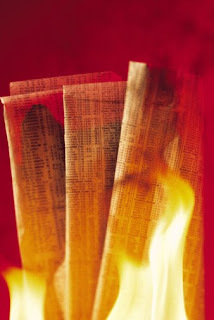 Eric Hamilton's Business & Technology Blog: Down with Newspapers! I agree bro! I've recently formed and LLC and a New York State Statute dictates that I must publish its establishment for 6 consecutive weeks in a legal newspaper! This will cost me at least $500. This, outside of the cost of fling all necessary paperwork to become an LLC will run me over $1000. Were it not for the publication statutes, the entire process would cost me under $400. Newspapers...wake up! Outside of providing a place to put my discarded seafood innards...what good are ya? Eham, I agree with you totally! my mom and I have constant debates about how ineffective news papers are versus technology, hence the decline of the most archaic medium known to man. Hey E! I'm so withyou on Newspapers. When I was looking for options to market my new book "5 Steps to the Hollywood A-List Smile", I priced out a few small NY papers (Village Voice, Backstage, ect to find that for the smallest of ads were around $1000+. I thought that fee was bad,until I decided to consider advertising back home in Flint, MI(The Flint Journal)! Do you know a 1/4 was around $1200! No way was that going to happen. So I feel you pain Frat. So sorry that you are Required to do this. But wow, congrats on your non-profit! This non-profit will arm people with a valuable skill and provide a service that some startup companies or even existing companies can't afford right now. Keep up th great work E! I'm sorry that you had such a frustrating experience. A lot of the information that you mention in your post is considerably flawed. NOT TRUE-I'm not sure what you mean by "most people" ; 4 out of 10 American HH still receive a paper each day. That generally translates to 2.5 readers per copy. Newspapers reach key audiences: educated, affluent and older. Very few Americans get their news and information from only one source. There are still 1408 DAILY papers in circulation plus thousands of small, weekly community and/or niche publications. Daily US circulation is 42MM and Sunday is 49MM. Apparently a lot. For clarification - it's not the SAME reach. In order to do fair comparisons, you need to be specific about which audiences are being reached. Actually, of the $142B dollars spent on advertising in 2008, 17.7% of it was spent in NP - the second largest amount spent for a single category behind broadcast TV (18.5%); to most people's surprise, that number used to exceed TV for decades. $9.73B was spent online (6.9%). (3) there isn’t any detailed analytics about who is reading the ads. With online advertising enabled with analytics, I know, age, gender, area code, zip code, city, and overall interests of every person who clicks my ad. True. There aren't detailed analytics about NP readers who are reading ads real time. But, NP know A LOT about their subscribers. Online advertising certainly has its place as a valuable ways of reaching many different audiences. Like most media, it works well in conjunction with other media and to serve specific marketing objectives. So while it’s free to visit newspaper sites, I agree that physical paper media should be abandoned for online. But if the online news and magazines ever start charging an access fee, the statistics for who uses the net vs who accesses paid media outlets will be drastically different. Beyond all this talk about physical papers vs online, your gripe should be with the law as written, and not the promulgated media. I agree...the ads are insane. As a board member for a Cayman charity, we can't afford a spread unless we land a sponsor. But since so many people are anti-newspaper and turning to their computers to keep up to date, companies are selling fewer papers and therefore need to make money somewhere...hence the advertisers. And Musa...newspapers can be used to clean glass instead of paper towels, to line bird cages, to donate to animal shelter, and have you ever made anything out of paper mache? If not, local schools probably can turn your trash into treasures! Oh, Preach on Paper Chaser, preach on!!!! Your name fits you well along with the other dinosaurs who can't seem to get with the times. Here is a quote from the U.S. Census bureau "New data from the U.S. Census Bureau show that 62 percent of households reported using Internet access in the home in 2007, an increase from 18 percent in 1997". You mentioned 40% of households by a daily paper. My sources tell me that 12.9% of American buy a daily newspaper. So, you are wrong about (1). Most 62% is higher than 12.9% so you are wrong about (1). In summary, newspapers are going the way of radio as the primary source of entertainment or the telegraph as the hot communications system. I think I will throw up if I hear one more person mention this so called "Digital Divide". Black folks have been making excuses for years why they can't achieve and the "Digital Divide" is the newest excuse. Back in the 60s, Black folks had real discrimination, now Black folks are making barriers when none exist. I used to own rental properties in the worst parts of Detroit. My tenants did not have a lot of money. They did NOT have a computer or internet access, but they did have a Big Screen TV (bigger than mine) and Cable with the Premium movie channels... The son had the latest $100+ athletic shoes and everybody had mobile phones. They were on the wrong side of the "Digital Divide" by choice. A netbook computer is less than $200. I don't think there are people sitting around conspiring to hold Black people back by limiting access to computers and the internet. The last time I checked Apple, Microsoft and Comcast accepted Black folks money. On another note, I started the Web Academy to help expose the masses to technology. This fall, the City of NY is hosting a computer application development contest. I decided to enter the Web Academy and I solicited my entire network of students, friends and family to join my team to build an iPhone application. No experience was required to be on my team. You just needed to sign up. You all probably got an email from me. About 85% of my network is African American, 10% Caucasian and 5% other. Why is my iPhone development team 20% African American 40% Asian and 40% Caucasian. I'm willing to work with anyone who is willing to work with me regardless of color or national origin. So, did the "Digital Divide" keep African Americans from joining my iPhone development team? I applaud your blog and your views about the internet. I've enjoyed reading newspapers, magazines, and journals my entire life. But there is nothing...nothing like having access to the vibrant mix of ideas, opinions, research, and opportunities online. I'm also thrilled to hear you have started the Web Academy. I'd like to know more about it and follow your adventure in making it grow. I am not sure if I understand why you are calling for newspapers' collective demise as your primary argument seems to be that you are mad that you had to pay $234 for an ad. Nor do I understand why you believe online readers are willing to "pay 10 times the money for the same reach." It's hard to convince such readers -- who are used to free news -- to pay a monthly subscription fee. I do, however, agree with you about the value of analytics to advertisers. I don't work on the sales or business end of media so I am not sure how widely used analytics is used to gauge advertising demographics. I am a journalist and am very much aware of how the media landscape is changing. I am not ready to say it's a good thing or a bad one. Just trying to adapt along with everyone else. I think you should start by pitching to the newspapers that have the same Owners as a Consultant on your concept and get paid to Consult with them about it. Access to media should not be device based. Platforms should be seamless and intelligent; and provide access by any web-enabled device and OS, making the ever emerging web an any user, any device friendly world. Newspapers...poor newspapers. I kinda hate to see them go. Invisalign, like the name suggests are invisible or clear aligners that gently help move and re-align the teeth without the use of traditional braces.